The Chord Catalogue consists of the 8178 chords possible in one octave. It is really just a list. The chords are simply stated, in a logical sequence, rather than being composed, and the main concern of the piece is to remain open to all sounds, all harmonies. It is fine to have personal preferences, and to feel that some sounds are more beautiful than other sounds, but it is also good to realize that there are an enormous number of possible chords, and that each one has something just a little special about it. Figure 1 – from Tom Johnson, The Chord Catalogue (1985). This didactic approach allows for the list to simply be heard unadorned by any other parametric constraints like dynamics, articulations, and embellishments, yet the groupings do allow for perception of a clarified process if one knows the concept and strategy of the music ahead of time –– and maybe even if one doesn’t. But what happens in the sounding music? Is what we are hear simply a catalogue of the possibilities of a music that the list provides within this inhabitable musical space? What gives life to the piece, and what is the nature of the music? The groupings of the n-note chords (and indeed the groupings of the internal rhythms of each collection) feature numerous interesting mathematical details. If we look carefully at the total number of chords in each subset of the octave, we can see the following sequence: there are 78 two-note chords, 286 three-note chords, 715 four-note chords, 1287 five-note chords, and so on, through the final, single thirteen-note chord. This sequence, (78, 286, 715, …) can be found in the 13th line of the mathematical object known as Pascal’s Triangle2. This relationship to Pascal’s Triangle holds for each total grouping of n-note chords. The sum totals create a symmetrical structure. The number of two-note chords is the same as that of the eleven-note chords, that of the three-note chords the same as that of the ten-note chords and so on, as Pascal’s Triangle describes. In contrast to this feature, it’s noteworthy that musically The Chord Catalogue is slightly less symmetrical. There is a residue of the 13 twelve-note chords and the one thirteen-note chord at the end of the symmetrical structure, which do not have symmetrical counterparts. This is because only chords considered are those that consist of two-note chords or more, disqualifying the one ‘zero-note chord’ and the thirteen ‘one-note chords’ of the octave C4 to C5). If we look at the groupings as Johnson has ordered them, in each sequence of n-note chords we find similar structures. These derive from the fact that Johnson divides each set of n-note chords into sub-phrases, with the top note ascending. 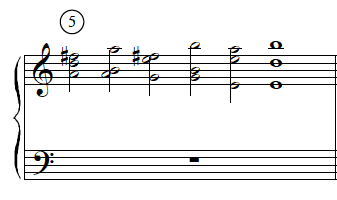 That is, the first phrase consists only of the (unique) lowest cluster of n notes; the second phrase of all chords with the top note one one step higher, giving more option; the third phrase of all chords with the top note one step higher again, etcetera. The resulting list of two-note chords is rather simple, since the number of possibilities increases linearly with the top note, each subsequent grouping extended by one, to feature a progression from one two-note chord to twelve two-note chords: a neatly organized, logical counting that results from the process of enumeration. But as early in as the three-note chords, other interesting things start to happen. The groupings in the three note chords reveal the triangular numbers (numbers that equal sums of numbers in a triangular arrangement, for example: of pool balls before breaking): after the lowest, three note cluster (c-c#-d), you get three possibilities with the top note at d#, six with the top note at e, ten with the top note at f, etcetera. The four-note chords give the tetrahedral numbers, which can be thought of as triangular numbers in the third dimension. Likewise, the rhythm of the groupings in the five-note sequence gives the numbers for hyper-triangles in the 4th dimension, the six-note sequence counts hyper-triangles in the 5th dimension, and so on. While you don’t really hear the math going by unless you are listening for it, what happens to the music is, in fact, a reflection of it. The polyphony intensifies as the dimensions of the geometric objects being represented increases. Sonically, the textures are crowded and intense; they grow ever more so as n-note sequences increase, leading to the final 13-note chord. I like to think of The Chord Catalogue as a sort of natural phenomenon – something which has always been present in the ordinary musical scale, and which I simply observed, rather than invented. What can be appreciated in The Chord Catalogue is not simply the “list” after all, but also the formation of a lucid, formal object with many structural interests, that unfold as a highly specific play of gradually developing rhythmical patterns, which give The Chord Catalogue its specific musical character. In a boarding school there are fifteen schoolgirls who always take their daily walks in rows of threes. How can it be arranged so that each schoolgirl walks in the same row with every other schoolgirl exactly once a week? Another work, more recent, is Intervals (2013), a catalogue of harmonies that explores the all-interval tetrachord. Another, Trio (2005), presents all 288 three-note chords of which the notes sum to 72 when middle C is assigned the value 24. Many more of Johnson’s compositional output incorporates the complete set of a particular parameter or parameters in the context of their musical content. Johnson’s pieces and other musical catalogues like it are much more than mere lists. These works go beyond the oft-seen contemporary Duchampian tendency to bring to the forefront the humble existence of a physical or conceptual object of the world and in it and place this object within the context of a deliberate aesthetic strategy to be observed and perceived as art. These works also offer new and discrete modes of perception to both the ear and the intellect. Can we say that our listening is conditioned by rationality and cognition of mathematical structures as we listen to the work? The experience might be something like looking at a Donald Judd sculpture. We are confronted with physical geometry, yet we are looking at a form of art. Could listening to musical catalogues be a kind of ontological experience as well as a simple, auditory one? What kind of proposal are we making, then? One way to begin entering into the world of musical catalogues is to look at two works that are related to Johnson’s groundbreaking catalogue in obvious ways. Within Fourths/Within Fifths by Samuel Vriezen and Combinations by the author of this article are, like The Chord Catalogue, each combinatoric. This pair of works also each make use of strict rhythmic logics that like The Chord Catalogue, are specified by local and global parameters which in themselves are a kind of catalogue, yet arrive each at very different kinds of musical results. Just like Within Fourths/Within Fifths and The Chord Catalogue, Combinations by the author of this article for piano four-hands addresses strict and elaborate combinatorial and rhythmic strategies. Combinations presents all of the 2036 combinations of the binomial coefficient, climbing from “one choose one”, through “two choose one”, “two choose two”, “three choose one”, “three choose two”, “three choose three” up to and including, finally, “ten choose ten”. Rhythmically, the piece integrates a nontrivial rhythmic sequence5 and a harmonic language that was composed without respect to a logical process. Figure 2 – from Dean Rosenthal, Combinations (2011). Figure 3 – from Dean Rosenthal, Combinations (2011). Sample 2 – from Dean Rosenthal, Combinations, private recording courtesy of the composer. Four subsets have been formed. Each new subset contains, in order, the groups of combinations containing only note one, then only note two in the first position, then note three in the first position, and then note four in the first position. Yet the music takes on several additional characteristics. 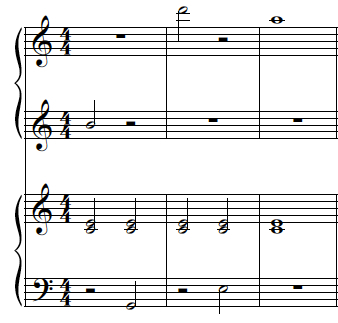 The first three groupings in the excerpt begin and proceed in half notes, but conclude on whole notes. After each grouping there is a measure of rest. These rhythmic strategies are applied strictly throughout the work. The sums of the groupings of combinations neatly count down 4,3,2,1 from the first grouping of four combinations. This logical descending counting pattern emerges from the nature of the mathematics, cementing further order on the found object combinations. As the patterns get longer, however, the countdown starts happening on more levels. Figure 4 – from Dean Rosenthal, Combinations (2011). Sample 3 – from Dean Rosenthal, Combinations, private recording courtesy of the composer. The groupings of chords are still counting down neatly 5,4,3,2,1 (2 and 1 follow in the sequence and are not shown). The harmonies have become much richer and the phrases longer. Here, the subtle harmonic change that the first four (fixed) notes of the chord/combination and a moving fifth voice allow reaches deeper into the strata of combinations. Because the combinations now consist of collections that include a total of nine notes, the length and variety has altered the sonic landscape. The consistency of the rhythmic design maintains the flow of the music. Like The Chord Catalogue, Combinations counts out the numbers of Pascal’s Triangle, but here the list of combinations, given in order, counts out each of the numbers in the lines of Pascal’s Triangle, all the way to the tenth line, rather than counting n-dimensional hypertriadic numbers along the Triangle’s diagonals. Combinations has a different relationship to the same mathematical object, representing the fact that the Triangle consists of the binomial coefficients6. This is not a trivial distinction. Where within each section, Johnson’s phrases grow longer as he reads the numbers diagonally down the triangle, Combinations has sections that inherit the symmetry of their phrasing structure from the symmetry of each horizontal line of the triangle — though the subdivisions inside each n-note section are rhythmically organized such that the phrases become slower and more fragmented as the chords approach higher density. This leads to a very different development of energies within each phrase: ever-increasing activity and density in The Chord Catalogue; ever more spacious timing in Combinations. On the higher level of the sections themselves, though, we find the inverse relation: The Chord Catalogue having sections that symmetrically expand in length, then contract; Combinations, with its ever-increasing sections, as there are more and more notes to choose chords from. The sound that emerges in Combinations is very different, more spacious and much calmer; the language of the rhythmic structure is primarily what creates that distinction. While deploying strict rules with respect to the harmonic combinations and rhythmic structure, one parameter is determined by taste: the choice of scale, which was freely composed. The ten notes chosen span four octaves and include only naturals. The emphasis appears in three areas of the keyboard, a low C major triad in 2nd inversion, a C Major Seventh chord at Middle C and two stacked fourths in the upper register. This strategy may be seen as an attempt to color the music aesthetically while allowing for the mathematics to be heard in a rational, logical, and complete way. Thus, the piece is no longer a simple list and now has one extra parameter. Figure 5 – from Dean Rosenthal, Combinations (2011). Sample 4 – from Dean Rosenthal, Combinations, private recording courtesy of the composer. Figure 6 – from Dean Rosenthal, Combinations (2011). Sample 5 – from Dean Rosenthal, Combinations, private recording courtesy of the composer. This extension and equilibrium of the harmonies enriches the logic, anchoring the familiarity of each combination and allows the development of the progressions to be detected audibly and perceived. This perception may not be the only goal and may consider an equally reasoned aesthetic of taste. The aesthetic of taste reveals an elusive aspect of all musical catalogues. Catalogue composers must choose their global parametric constraints, and then how to present them, even within totally rationalized systems like the rhythmic grouping in The Chord Catalogue or, as described below, the cycle of fourths in Logical Harmonies (1) by Richard Glover and the rhythmic pattern of Clapping Music by Steve Reich. In these works, composing requires selection of registers, instrumentation, harmony, and rhythm. Every composer of a musical catalogue that chooses, for example, a logical, cyclical harmonic progression that suits the intention of the work identifies the choice that clearly could be much different, more elaborate, more inconsistent, more opaque. Are transparency and perceptibility only musical goals for seeking objectivity? What defines a less logical choice and one more so? What would be the reasons for choosing one over the other? In Within Fourths/Within Fifths, Samuel Vriezen has constructed a catalogue work for solo piano that develops its harmonies on the basis of interval and scale structure. Taking as a basis the intervals of a perfect fourth and a perfect fifth, Within Fourths / Within Fifths explores, in the composer’s words, “all possible chords from 1 to 5 voices, where each voice is limited to three scale positions within the interval of a fourth, with the fourths stacked.. [and] … all possible chords from 1 to 5 voices, where each voice is limited to four scale positions within the interval of a fifth, with the fifths stacked”7. Vriezen terms this work a “chord enumeration” piece, expressly indicating both harmonies and the idea of the “list” that Johnson expresses when he writes of The Chord Catalogue in his article. Figure 7 – from Samuel Vriezen, Within Fourths (2006). Rhythmically, the first two chords progress from half note to whole, while the last is a whole note. Thus, the two bars both end on a whole note; in fact, all bars of the piece end on a whole note, otherwise containing half notes exclusively. 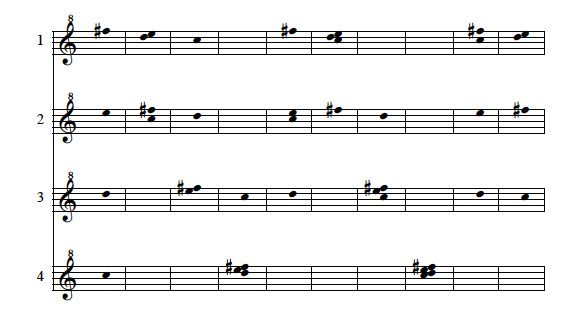 The first two chords are both sums of ’0′ and ’2′, and are grouped together as a two chord phrase, while the last chord, a single sum of 1+1, forms a single unit. This ordering of entrances settles on the natural logic of “finding the music”. Figure 8 – from Samuel Vriezen, Within Fifths (2006). That is, the first measure gives all possibilities of adding a ’0′, a ’1′ and a ’3′. Likewise, the second bar gives all possibilities with ’0′, ’2′ and ’2′; the third, all possibilities with ’1′, ’1′ and ’2′. This list of permutations is an example of the pattern that continues in the subsequent measures, and in fact throughout the entire piece, from start to finish. I like to think of catalogues as in-time maps that completely explore spaces of musical possibilities, that themselves are parametrically defined and have a so-to-speak out-of-time existence, and the method of relating those two (in and out-of time) is what makes the life of the piece. The rhythmic design adds much variety and temporal interest, and there are also motivic melodic structures and recurring harmonic structures that emerge. In Section III of Within Fifths, melodies that appear in the soprano voice reappear in Sections IV and V as part of slightly altered harmonies. In subsection 5 of Section III, the six-note melody F#-A-F#-B-A-B in the soprano voice comes back in subsection 6 and 8 of Section IV above identical two-note harmonies. These harmonies are sustained by a newly introduced D (a fifth lower) in subsection 8 (In subsection 6, the bass note is Bb). 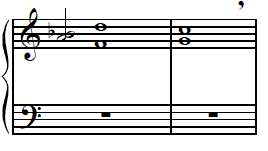 In subsections 10 and 11 of Section V this melody reappears amid longer progressions. The harmonies repeat with an added G in the bass in subsection 10 and an added F in subsection 11. Figures 9, 10, 11 – from Samuel Vriezen, Within Fifths (2006). There are numerous other melodic and harmonic motivic recurrences. These developments in the music create a kind of kaleidoscopic effect. The melodies that come out of the mathematics have a modal, Satie-like quality, not unlike what one might hear in the Gymnopédies. The mathematical logic that results in the bass notes in Section IV and Section V rewrites the earlier harmonic progressions. The voicings are identical. It’s a consistent outcome that offers new hues of harmonic color within the context of logical framework. The idea and the music are married completely and equally. Does the life of the piece move closer towards the conceptual or the audible? A pair of musical catalogues that take a completely different approach to cataloguing is Logical Harmonies (1) and Clapping Music, respectively by Richard Glover and Steve Reich. Here there is an attempt to separate rhythm and variation from what’s perceptible and what’s transformed by the compositional strategy. Figure 12 – from Richard Glover, Logical Harmonies (1) (2011). Sample 8 – from Richard Glover, Logical Harmonies (1), recording from the composer’s website. The symbols indicate major triads in any inversion. Scored for solo piano, the left hand plays the bottom line, the right hand the top. Glover describes the ground rules at the beginning of the score: try to stay within a two octave range, don’t let your hands cross, and choose inversions that are close to each other. 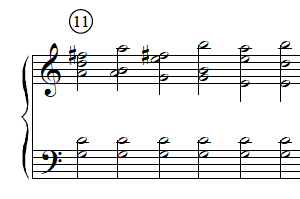 The first line shows both the left and right hands in rhythmic unison completing a progression of fourths, both rhythmically and harmonically. 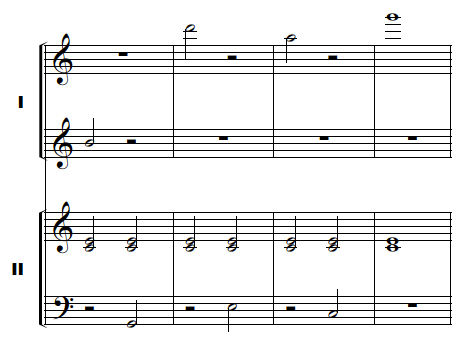 In the second system, Glover pushes the right hand backward one position; the harmonies of the two hands are again heard simultaneously. This continues throughout the piece: the process of moving the right hand one position backward, in identical rhythm, continues until the two hands are playing at unison once again. This allows the entire catalogue of harmonies resulting from this process to be heard. 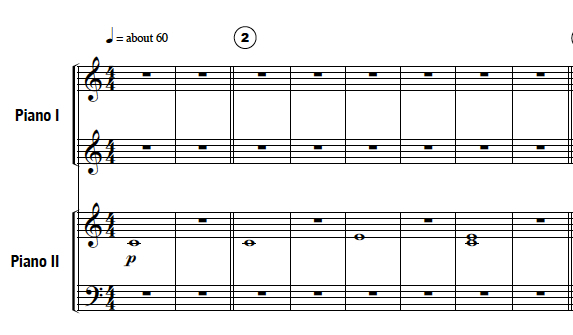 Figure 13 – from Steve Reich, Clapping Music (1972). 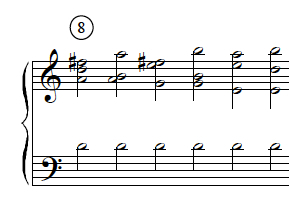 This is an example of Reich’s well-known phasing technique without the blurred, sparky motion of gradual phasing found in earlier pieces like Violin Phase and Piano Phase. Because each of the possible combinations of the combined patterns is used, Clapping Music falls under our definition of a musical catalogue. The rhythmic pattern is stated, begun in unison by two performers. Then, performer one pushes ahead to the next position while performer two continues to repeat the original pattern as in Glover’s piece, where the right hand does the same. This continues until the two performers return to play the original pattern in unison once again, at which point, after twelve repetitions, the piece ends. In Clapping Music there are 12 beats per bar, 12 bars, and each bar is repeated 12 times. Reich’s basic rhythmic pattern cycles through groups of one, two, and three beats, but the process reveals resultant patterns with complex, variable metrical figurations. In his directions to the performers, Reich notes that no accents should be made and that, “it is for this reason that a time signature of 6/4 or 12/8 is not given – to avoid metrical accents.”9 The resulting rhythmic patterns that come out of the process are what are being catalogued here. This is a kind of “found music”. The composer wants to stay out of the way of the material and the process. The structure is undeniably similar to Reich’s phasing works, although that’s not how it was conceived. I was, and am, aiming for a continuous subtle transformation in the sound; enough of a transformation for the sound to perceptibly change, but not a transformation in which the change draws attention to itself. Rather, a continuous stream of gradual change. Taking the same thing and gradually moving it out of sync with itself is an effective way of producing this kind of result, and knowing that 12-tone equal temperament has this beautiful, closed system of superimposed fifths, which can be played by two hands on the piano, gave me a perfect musical object to gradually transform. It was not designed as a ‘phasing’ piece per say, but that is certainly what the piece is. It provides a wonderfully ‘flat’ surface in terms of the performer’s instructions, and allows the triads of Western tuning to do the work in generating the harmonies. What Glover refers to as the “continuous subtle transformation” and “continuous stream of gradual change” allows us, as listeners, to encounter perceptual differences by means of ever-changing progressions. There is a kind of twisted shifting to the harmony. It’s a weird spiral that has a warm, rich, natural mechanism of growth. Reich’s work brings us into the realm of rhythm alone. Clapping Music offers discrete, repeatable segments. The music is strict, almost scientific. The listener’s interest is in the kaleidoscope of pattern, repetition, and variation. Glover’s idea of “gradual change” echoes Reich’s idea laid out in his famous essay, “Music as a Gradual Process”. Yet these are two very different pieces. The meanings of “change” (to become or make different) and “process” (a series of steps or actions taken to achieve a result) point to the contrast in strategy. Glover is after audible harmonic transformation, Reich wants systematic metrical variety. The catalogues discussed so far lay out the music with all (or almost all) of the cards face up: the musical material, whether rhythmic, harmonic, melodic, and intervalic in nature, is presented in a purely logical and transparent manner. What about an approach where a musical catalogue is composed more flexibly? Paul Epstein has made a collection of pieces based on drawings by the American artist Sol LeWitt that are devoted to geometrical shapes and structures. One piece in Epstein’s collection is Drawing No.3 (Slow Title). This work is a catalogue, but the way Epstein presents the catalogue is selective and somewhat free. The generative melodic pattern, taken from the grid, is composed by locating pitches within the diatonic collection. The melodic pattern begins on C in the first square of the lower bottom left of the grid; counting vertically: C-G-A-D-Bb. 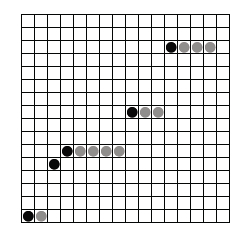 The durations on the grid are greyed in, each square equaling an eighth note: the first pitch C equalling a beat, the G half a beat, the A two and a half beats, and so on12. A look at the first phrase shows how Epstein translates his wavy line into music. From this process, he generates larger forms by rotating his grid to create variants of the mapped melody, including the inverted, retrograde, and retrograde-inverted forms of both the variant and the original, and then cataloguing the twenty-eight possible combinations of those eight forms13. Figure 16 – from Paul Epstein, Drawing no. 3 (2010). I honestly don’t worry too much audibility. As much as my Drawings were influenced by LeWitt, there’s a crucial and obvious difference: with the graphic works you have time to study them, find the patterns, and check to see that all the possibilities are in fact used. With the music you pretty much have to take that on faith while listening, or else go through the score with gun and camera. Analysis is certainly possible, but I’m not sure it will make much difference to the listening experience – unlike analysis of classical tonal works or even of some early minimalism. With just about all of my recent pieces there are elements – register, dynamics, articulation, etc. – that are composed either freely or (more often) by a variety of procedural systems such as chance or serialism. The systems differ from piece to piece. They may be chosen based on rational criteria: the desire to maximize or minimize repetition may influence the ordering of patterns and pattern combinations; or it may be just a matter of what I think will sound good. Epstein’s desire to avoid immediate repetition can itself be investigated systematically. Indeed, one could investigate the notion of ‘maximum change’ with respect to musical space. This could mean the maximum number of changes to a melody or a melodic fragment within the scope of possible, correct solutions to a counterpoint exercise, or the maximum number of chord changes in a symphonic movement taking into account some particular rule of functional harmony. Michael Winter’s composition maximum change is an enumeration of all possibilities of a fixed four-note chord performed by up to four different instruments and there is maximum timbral change from chord to chord. More formally speaking: the maximum timbral change of a static chord of four discrete pitches as played by up to four instruments with distinct timbre, where each pitch is assigned a different instrument upon each successive event. Thus, the composition is an inquiry into timbral change. In the case of maximum change, the rather simple solution used to create the piece was found independent of the proof. The solution generates a list for each of the 4 pitches that determines which instrument it is assigned over time by an algorithm that works as follows. For each pitch generate a permutation of (1,2,3,4). For the first pitch, simply repeat that (ordered) set 64 times. For the second pitch iterate the set 64 times, rotating it left by one position every iteration. For the third pitch, iterate the set 64 times, rotating it left by one position every 4 iterations. And finally, for the last pitch, iterate the set 64 times, rotating it left by one position every 16 iterations. Figure 17 – from Michael Winter, maximum change (2007). A few other aspects of his catalogue are worth noting. Winter defines his instruments as percussion instruments, each with long decay (such as circular plates, rectangular bars, hollow tubes, and struck strings such as crotales, glockenspiel, chimes, for example) and each being able to strike each of the four selected pitches individually and together. He also allows for transposition such that every occurrence of each pitch is transposed by the same interval such that the conglomerate chord always consists of four different pitches (in an alternate version, he allows four pre-determined pitches that are the same for the ensemble, but not those given explicitly in the first). The performers pause eight to twelve seconds between each attack, letting each tone of the chord ring freely and decay naturally. The number of chords that result from Winter’s calculations total 256 and therefore the performance time is roughly forty-two minutes in length, given an average ten seconds between each attack. In the alternate version of the piece, durations between attacks are made freely and pitches are predetermined but unspecified. Unlike the other catalogues discussed, Winter allows the music to avoid being absolute with respect to the timing. I take a different stance than Tom Johnson, although I appreciate his position. Tom feels that if you can’t hear the logic, then the piece has failed. I accept that someone could appreciate the piece on some other level I had not considered or on their own terms altogether. I don’t gauge the success of a piece or question someone’s experience based on whether or not they perceived my original concept. Regardless, like Tom, the logic of my pieces are never divorced from a musical investigation. There is an extraordinary variety to the approaches and musical results of these catalogues. In The Chord Catalogue, the idea of the “list” and the “object” appears. This touchstone work from 1985 offered a fundamental seed into considerable expansion of the catalogue idea. In a simple yet visionary work there were hints of great complexity and the latent potential of similar musical spaces. Another smart combinatorial project, Within Fourths/Within Fifths, helped us see how musical catalogues can be thought of as maps that explore musical spaces, and how this insight provided a deeper assessment of the catalogue project. Combinations shows that a catalogue with strict combinatorial and rhythmic logic can take yet even another shape, and introduced the idea that subjectivity manifests in the choosing of a scale according to taste, plays a role in all musical catalogues. Logical Harmonies and Clapping Music showed how two works can be constructed by utilizing an identical process, and still have a very different compositional goal and very different musical results. Drawing No. 3 showed how a musical catalogue can be constructed flexibly and without transparency. maximum change researched how timbral change can be conceived of as a strict parameter, further bringing out the variety and intelligent, rigorous design evident in each of these catalogues. Studying this meta-list of musical catalogues, it’s easy to conclude that there is much less consistency and rigor in such a meta-catalogue than there is in the individual catalogue works themselves. What draws the musical catalogues together is the principle of exploring every possibility of at least one parametric feature of a musical object, but every possibility could never be accounted for in the meta-list18. In light of this unusual characteristic of the meta-list of musical catalogues, how can these catalogues we’ve discussed be considered? I often like to try to do all the possibilities of something, so that there is a reason to stop the music somewhere, and I always feel more sure of myself if some mathematician confirms that I have done all of the possibilities. That explanation, while addressing the logic of the catalogue project, partially relies on another branch of knowledge, mathematics. This reliance doesn’t explain the utility of the condition imposed, though. It points to a deeper interest in completeness with respect to mathematics and the characteristics of logic, rationality, and order. But composing music with an interest in mathematics and logic doesn’t have to include every possibility of anything and indeed there are great numbers of works in which composers explore mathematical, logical spaces without composing a complete catalogue. All of these catalogues, including Johnson’s own Chord Catalogue, go beyond mathematical, logical features, leading into considerations of poetics and psychology. Composers of musical catalogues make complete and closed universes out of a single atom – the idea and the behavior of executing the idea. But it would probably be hard to tell to what degree this psychology informed the work without deeper analysis; this will have to be left to explore in future articles. One question worth considering more deeply is that of perception. Can composers convey the central idea of the catalogue to the listener as a sounding music? Can the listener perceive the completeness of a musical catalogue simply by listening? In some catalogues, like Drawing No.3, one would almost definitively have to know how the music was constructed first. In a piece like Clapping Music, it’s probably not easily apparent to most that the music gives each possible eighth-note variation of two identical parts without knowing this feature ahead of time. Yet in works of total transparency like The Chord Catalogue, Combinations, and Within Fourths/Within Fifths there is no guarantee that the concept will be heard without foreknowledge, either. Is knowing that one is hearing a musical catalogue while listening to a given piece of music important to reception of the music? Both Epstein and Winter, for example, state explicitly that from their point of view as composer this does not figure into things whereas Johnson and Glover may believe that this kind of perceived logic is what’s most relevant20. These questions posed are just a few to be answered; there are many more to be asked. The existence of these questions and these works show that the new tradition of musical catalogues has life to it. This new tradition will very probably continue to bear much good music and stimulating discussion far into the future, and that is an immensely exciting prospect.